I don’t venture above 50th street too often. It feels like a totally different world up there, mainly because of all the families and confused tourists. It’s been several years since I’ve enjoyed a true summer in the city. While most city-dwellers like to escape the concrete jungle, I’m looking forward to exploring it this summer. I’m envisioning afternoons exploring Central Park and having picnics on the lawn. In reality, I’ll likely end up in the park just once and get bitten by mosquitos and vow to never return. At least there are bars like The Roof that provide a picturesque view of the park from the outdoor terrace. Truth be told, I’m more of an outdoors drinking gal than a park ranger. 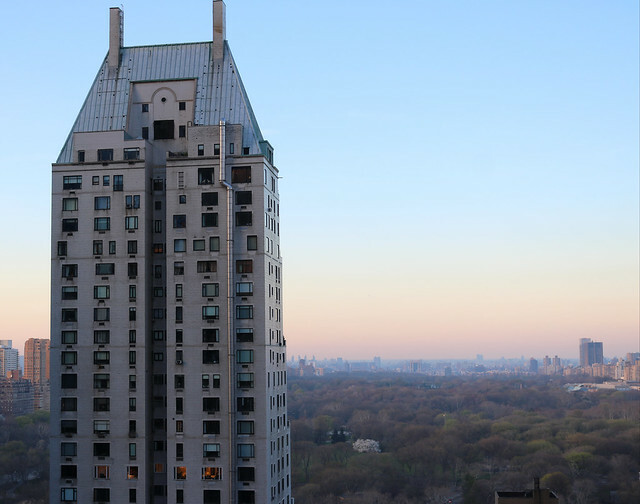 The rooftop bar is situated atop of the Viceroy Hotel near Central Park South. You don’t need to hike up too far uptown to make it here. The Roof also has a sleek indoor lounge outfitted with brass details, walnut and leather seating and wood tables. The space is designed to inhibit the aesthetic of a luxury airliner. With brass detailing, walnut and leather. The interior also features images of the sky, sea and clouds captured by Dalton Portella. While the inside is impressive, the view from the terrace is breathtaking. I ended up meeting one of my dear pals from college for drinks with a view. We rarely get to hang out one on one these days so this was a nice setting. The view of Central Park was unbelievable. We happened to arrive just in time for the sun to set. The rooftop was packed despite it being chilly outside. With a view like that of Central Park, I would brave the cold too. 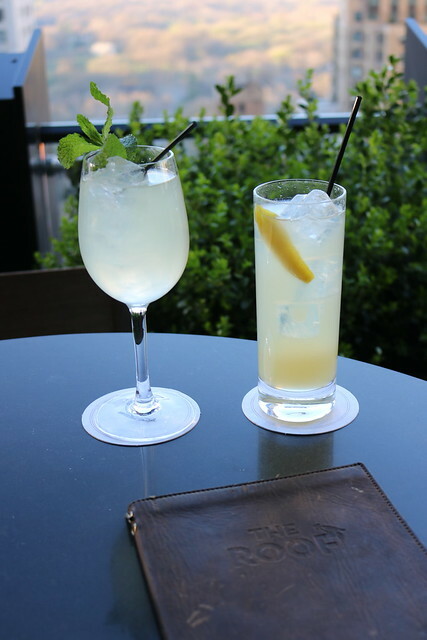 The menu at The Roof features an offering of small-batch spirits along with regional craft beers, wine offerings, and a rotating selection of cocktails and small plates. For the first round I went with a the Grand Spritz. Blame it on, Cori Sue, our HBIC, but I’ve been getting really into spritzes these days. This was not your average spritz with Aperol. Grey Goose, St. Germain, Domaine Chandon come together for a boozy concoction combined with fresh lime juice. It was satisfying to say the least. Swati went with the Elyx Cup. The bright beverage had Absolut Elyx Vodka for a base and includes muddled mint, cucumber and fresh lime. Both of our cocktails were fairly strong. We decided to split fries and a grilled cheese to hold us over. For our next round, Swati decided to stick to a classic Moscow Mule, prepared perfectly of course. I decided to experiment with the Lavender Collins, a Japanese whiskey based concoction. The burnt orange cocktail was pretty whiskey forward, thankfully simple syrup, lemon juice and lavender spice bitters balanced the flavors. While the drinks are decent, the view is the real reason to visit. Cheers! 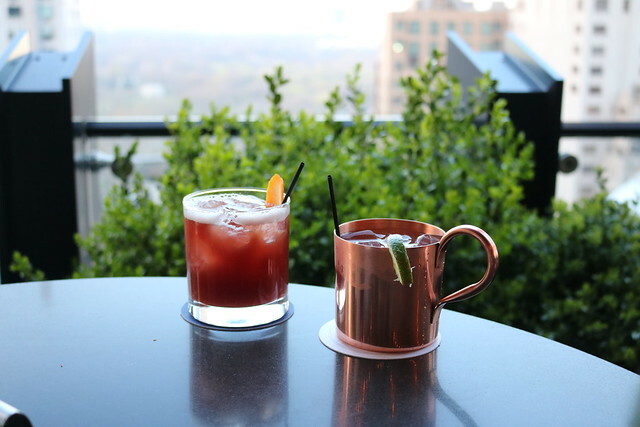 The Roof at Viceroy is a fantastic spot for taking in breathtaking views of Central Park over drinks.